Despite the name, it does savoury food as well as desserts; the name is a pun based on the fact that it's owned by rappers Krept and Konan. It was previously an Indian restaurant and bar called Chilli Room photo, but this closed down some time between July 2015 and May 2016. According to the Chilli Room website as of August 2012, all their meat was halal. 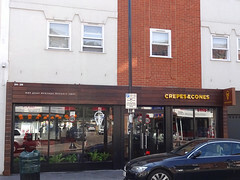 According to the menu linked below, as of April 2012 they would deliver orders of £15 or over within a three-mile radius. According to Pubs Galore, as of February 2013 it was fine to go in just for a drink. The premises were vacant and boarded up as of July 2016 photo. Still vacant and boarded as of September 2016. As of March 2017 the upper floors had been redeveloped into flats, while the ground floor unit remained boarded up. Still vacant as of July 2017 photo and October 2017. Last edited 2019-01-06 14:28:09 (version 33; diff). List all versions. Page last edited 2019-01-06 14:28:09 (version 33).